A few examples of common bone and foreign body curettes are featured below. 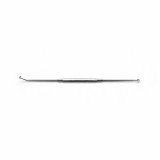 We can reference any catalog number from any company and we can help you with even the hardest-to-find surgical curettes. Contact us today for a hassle-free quote.